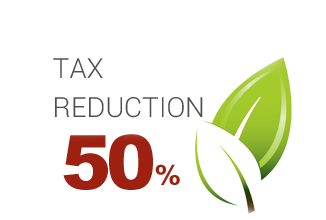 The 50% tax deduction for renovations or energy redevelopment such as the replacement of windows and doors is also valid for 2019! The amount that can be deducted is the VAT included and is returned in 10 years, in the form of a discount on taxes to be paid. The fundamental requirement for access to the tax deduction is the compliance with a given limit value of thermal transmittance of the door or window. The thermal transmittance gives an indication of how much the element passes heat. It follows that a low transmittance value corresponds to little transmitted heat, so a window is much more efficient the lower its transmittance value will be. These parameters can occur in the certification of the frame that the manufacturer is required to provide and that must be kept for the purposes of tax deduction. Vaber Frames supplies only certified products for its customers.